Equine Assisted Counseling is a form of animal assisted therapy that incorporates horses and other equines (donkeys, mules, etc) into the counseling process. This intervention is co-facilitated by a licensed counselor and certified equine specialist. Please click here to learn more. Why do I need an Equine Specialist? The primary job of the Equine Specialist (ES) is to protect the physical safety of both clients and animals. 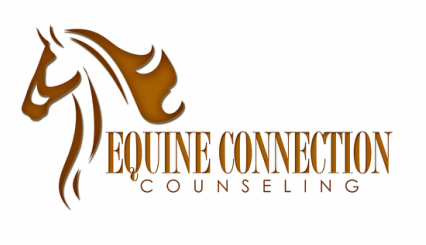 The ES is certified through the Professional Association of Therapeutic Horsemanship International (PATH) and is trained to work with horses in mental health practice. The ES takes primary responsibility for the welfare of the horses during the session and will work with your counselor to carefully balance your needs with the needs of the animals. The ES will also monitor the animals for stress (and intervene when necessary), assist with treatment planning, and offer feedback during the session. What is the difference between Relational Equine-Partnered Counseling and Equine-Partnered Play Therapy? Read more about EPPT here. There is no riding in equine assisted counseling - all work with horses is done on the ground. We believe that working with horses on the ground is not only safer for you, but also enables you to form a more authentic relationship with your horse without the interference of bridles and saddles. Although engaging in riding lessons is not permitted while you are receiving equine assisted counseling, we can assist you in transitioning to therapeutic riding after equine assisted counseling has ended. We recommend that you wear something that feels comfortable to you. As we are outside with horses, you can expect your clothes and shoes to get a little dirty! We strongly encourage you to refrain from wearing sandals, open-toed shoes, and steel-toed boots. We recommend boots and closed-toe shoes with a strong sole. Children under the age of 18 are required to wear appropriate footwear during interaction with horses. Boots may be available for you to borrow during your session. Helmets are not required, but are available upon request. We encourage you to bring water, sunscreen, and bug spray. Layers, hats, and gloves are strongly encouraged during the winter months. At the current time, we do not file directly with any insurance companies. However, we will provide you with the necessary paperwork to file for reimbursement with your insurance company for non- or out-of-network services. Please read more about our fees here. Do you cancel sessions if it's raining, too hot, or too cold? We try to avoid canceling sessions due to weather except when absolutely necessary. During inclement weather such as rain or extreme hot/cold temperatures, we may move the session to a covered area or indoors. In the case of dangerous weather (such as tornadoes), your counselor will call you to cancel. We strongly encourage you to complete and bring the appropriate paperwork to your first session. You will the paperwork in your welcome email after scheduling the first appointment. By completing this paperwork in advance, we will have more time to thoroughly discuss your concerns and interact with the horses. ​Upon arriving, you will first meet your counselor and equine specialist treatment team. You will then go to a private space with your team to discuss your concerns and goals for counseling, as well as complete intake assessments. The remaining time will be used to get to know the horses. Once you have found a horse with whom you feel comfortable, you can select this horse as your chosen counseling horse to work with each week.